Carburetor Parts & Rebuild Kits for Carter, Holley, Ford, Rochester & Stromberg. 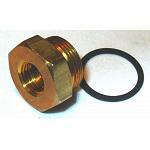 This fitting makes it easy to hook up a rubber gas line to your carburetor. Barbed side of fitting is made to slip into a 3/8" rubber fuel line. 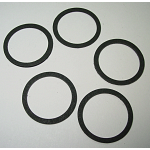 Gasket is included with fitting. 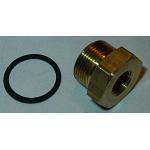 Fits carburetors with 5/8"-20 inlet threads. 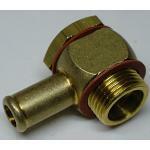 OAL: 1.200"
Replacement 2G Inlet fitting. Seal is included with fitting. Fits carburetors with 5/8" inlets. OAL: .685"
Hard to find fitting, VERY limited quantities! Ford/Motorcraft 2700 VV, 7200 VV carburetors. Holley 3160, 4150, 4152, 4160 carburetors. Holley 5200, 5210, 5220 carburetors. Holley 6500, 6510, 6520 carburetors. Rochester B, BC, BV carburetors. O-ringed repair fitting repairs carburetors with stripped fuel inlet threads. 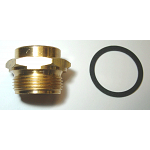 Expanding dual "O" ring fitting effectively repairs leaks at the fuel inlet caused by stripped or damaged threads in the carburetor casting. 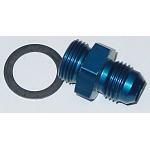 This fitting has an oversize thread with the cutting action of a tap. Use care to start it straight. For good cutting action, rotate the new fitting 1/2 turn forward, then back it up 1/4 turn, then forward 1/2 turn, continue until the new fitting bottoms with the hex section of the fitting against the casting. Remove the fitting and clean all metal cuttings from both the carburetor cavity and the fitting. 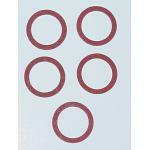 Install the filter element spring, filter, gasket and fitting. Re-install carb and test carefully for leaks, with engine running and full fuel pump pressure at the carburetor. If any leakage occurs in final test, DO NOT USE, until proper corrective action has been taken. 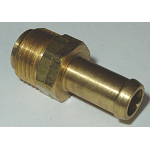 Replacement Inlet fitting has extended threads to grab deeper into carburetor castings. 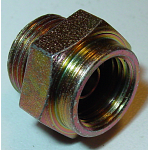 Many main body castings have threads that are not used by OEM inlet fitting. 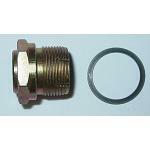 Seal is included with fitting. 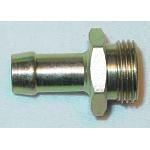 Fits carburetors with 7/8" inlets, uses short fuel filter. 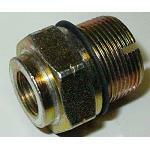 OAL: .900"
Replacement Inlet fitting has extended threads to grab deeper into carburetor castings. 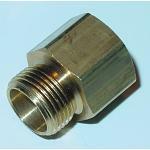 No machine work or tapping is required, many main body castings have threads that are not used by OEM inlet fitting. This is not a self tapping fitting. Seal is included with fitting. Fits carburetors with 7/8" inlets and 3/8" gas line, uses short fuel filter. 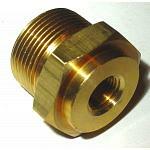 OAL: .800"
Replacement Inlet fitting has extended threads to grab deeper into carburetor castings. 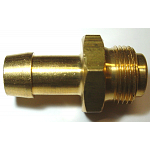 No machine work or tapping is required, many main body castings have threads that are not used by OEM inlet fitting. 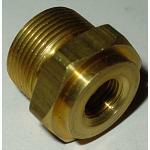 Verify that your main body casting has sufficient threads to accept this extended thread fitting. This is not a self tapping fitting. 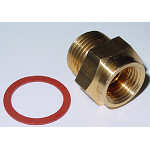 Seal is included with fitting. Fits carburetors with 7/8" inlets and 3/8" gas line, uses short fuel filter. 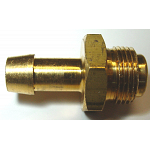 OAL: 1.100"
Self tapping inlet fitting for use with 7/8" diameter inlet with 3/8" gas line. Includes new inlet gasket. Uses long fuel filter. 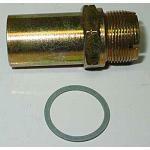 Self tapping repair fitting repairs Rochester carburetors with stripped threads. Made of tough steel, this self tapping fitting will reach deeper into the main-body casting, cut and engage new threads. Quick and easy to install.